By now, you may have heard the prediction that over half of the workforce will be independent contractors within the coming decade. While this is a staggering metric, these independent workers are themselves scattered throughout the economy. In fact, across most industries, there are more enterprises seeking independent contractors than workers to take on these projects. With progressive enterprises attempting to harness the gig economy faster than workers can populate it, it overwhelmingly falls on the enterprise to attract the top talent, competing with peer companies for both full-time and contingent workers. Understanding the value of independent talent is a great step towards becoming a more innovative enterprise, but reimagining work means more than looking for a one-off freelancer. It means finding innovative ways to attract, engage and protect the talent that chooses to engage with you in the changing workforce landscape. When enterprises set goals, they often visualize a singular path from point A to point B and then hire employees to get them there. This approach artificially forces mutable strategic needs into an antiquated mold. Agile enterprises, on the other hand, take a magnifying glass to their goals, break seemingly singular workstreams into discrete projects and identify the specific skills needed to complete each step. This allows employees to be mission-driven, focusing on the broad goals and strategies of the company, while independent talent can fill any skills gaps. It also frees enterprises from rigid long-term blueprints, allowing them to pivot when necessary to more efficiently meet and update goals. One of the most tedious parts of incorporating independent contractors into an enterprise is the insurance requirements. Not surprisingly, many enterprises will set the requirements and wipe their hands of the issue. The problem is that antiquated insurance requirements, which weren’t set up with the gig economy in mind, often put an unnecessary cost on independent contractors. This leads to one of two things: either the contractor will raise their rates to compensate for the high insurance cost, or they will leave. In the first scenario, both parties are paying more than necessary, with insurance companies seeing the only real benefit. In the second, both parties miss out on opportune partnerships. This isn’t to say your enterprise should sacrifice protection for flexibility. 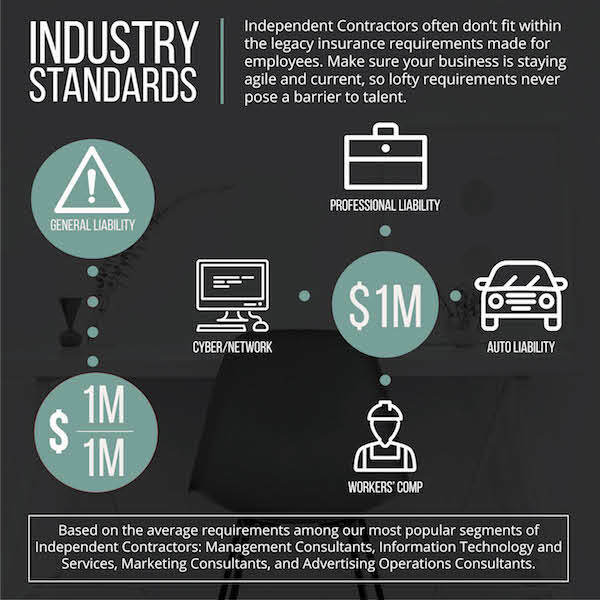 However, because the ball is in the independent contractors’ court, it’s important to make sure insurance isn’t a barrier to talent. The gig economy can be complex and intimidating. Luckily, there’s plenty of infrastructure in place to help you navigate the new terrain. Identify platforms that will provide you with the talent you need, pre-vetted and ready to work when you most need it, so that you can harness the gig economy without keeping track of all of the moving pieces. These technology platforms reduce risk for gig workers and ensure enterprises and organizations equip the worker with exactly what they need to achieve success. The flip side of adding technology to aid workforce agility is the need to train and support full-time staff to leverage it appropriately. Educate your full-time workforce on the value of independent contractors, including how to leverage them appropriately and how to facilitate a collaborative working environment. For example, providing positive feedback and celebrating wins with independent contractors can advance your team’s communication and cohesiveness, creating a positive culture and further bolstering your employees’ soft skills. Above all, maintaining open lines of communication will help your team keep everyone in the loop, on the same page, and working towards the same goal. The workforce is rapidly changing and legacy systems must change with it. The overwhelming shift to contingent work represents not only a shift in office makeup, but in the mentality of the workers themselves. The future of work is efficient, agile and competitive, meaning that enterprises will have to prioritize agility in order to keep pace with the modern workforce. If you are an independent contractor navigating tricky insurance requirements or an enterprise leader stuck wrestling internal policy, explore Bunker’s options for liability protection — created with the gig worker in mind. recognized as a Fortune 1000® 2018 company.